Contemporary, architecturally designed Bi−Folding Doors, which create a stunning, feature for your home. Solitaire Windows Bi−Folding Doors can complement any home, and will give you a whole new feel as you will open up panoramic views and bring the warmth and light of the outside indoors. Increasingly popular, Bi−Folding Doors can be chosen to match the style of your home and provide a smooth transition between your rooms, or between indoor and outdoor spaces. 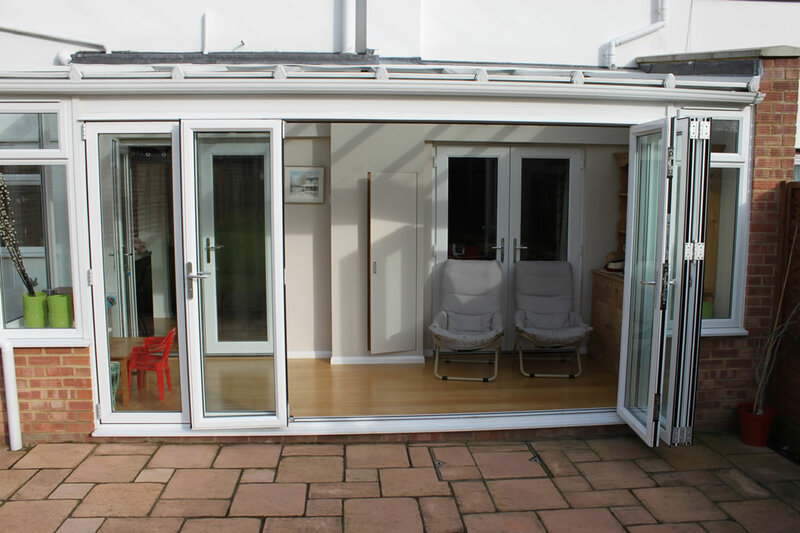 Upvc Bi-fold doors are an attractive alternative to French Doors or Patio Doors. They are available in a wide range of colours and finishes. The doors remain slim in profile and relatively unobtrusive owing to the strength of the modern materials used. solitaire Windows Bi−Folding Doors boast highly sophisticated folding and sliding technology to give many years of trouble free use. These elegant, concertina doors add a real "WOW" factor to your home, and seamlessly connect your outdoor and indoor spaces.